, led by Principal Investigator Dr. David Blackwell, has discovered unexpectedly high temperatures beneath West Virginia capable of supporting geothermal energy production. As a result, they have increased estimates of West Virginia's total heat content by 78% and geothermal generation potential by 75%. The discovery was made as part of SMU's project to update the Geothermal Map of North America supported by Google's RE<C initiative. The finding, first reported today in Science News, will be presented at the upcoming Geothermal Resources Council conference in Sacramento, CA. The finding indicates that West Virginia potentially holds the highest grade geothermal resources east of the Mississippi River. SMU estimates that 2% of West Virginia's geothermal resources could support over 18,890 megawatts of electrical generating capacity using Enhanced Geothermal Systems (EGS) and other advanced geothermal technologies such as Co-Produced Fluids and Low Temperature Hydrothermal. The SMU team has been developing entirely new pictures of the earth's geothermal resources. 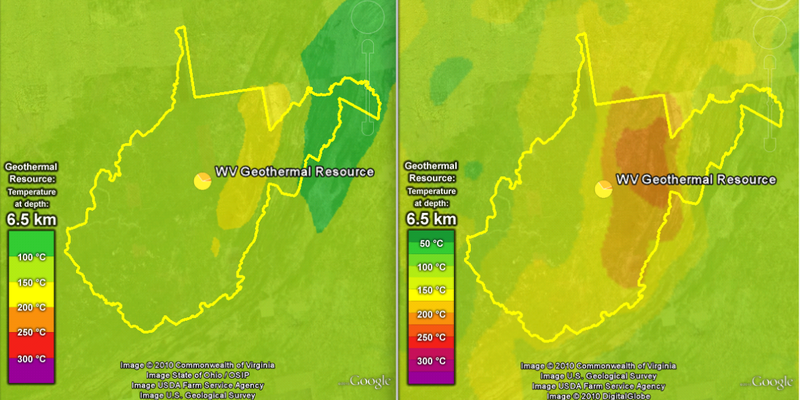 They have started by aggregating thousands of new Bottom Hole Temperature (BHT) temperature readings from oil, gas, and water wells in previously under-sampled regions of the U.S. For example, The 2004 Geothermal Map of North America featured only four temperature points informing geothermal estimates for West Virginia, compared to 1,455 points in the updated version. In addition, the team has improved estimates of heat flow through the earth's crust with better regional lithologic data. The new results indicate the potential for temperatures as high as 200c (392 f) at depths of 5 kilometers (16,404 feet). SMU's full U.S. project will be completed in early 2011 with a new map and national resource estimatess. With improvements in EGS technology, these resources can be harnessed to provide clean, reliable, baseload renewable power 24/7/365. Our congratulations go out to the SMU team for their exiting discovery: Dr. David Blackwell, Maria Richards, Zachary Frone, and Joseph Batir. For more information on Google.org's geothermal investments and research projects, please visit google.org/egs. Could clean, reliable, baseload geothermal energy be produced in the Pioneer State? The SMU Geothermal Laboratory, led by Principal Investigator Dr. David Blackwell, has discovered unexpectedly high temperatures beneath West Virginia capable of supporting geothermal energy production. As a result, they have increased estimates of West Virginia's total heat content by 78% and geothermal generation potential by 75%. The discovery was made as part of SMU's project to update the Geothermal Map of North America supported by Google's RE<C initiative. The finding, first reported today in Science News, will be presented at the upcoming Geothermal Resources Council conference in Sacramento, CA.